If Ballmer's revelation of the slate wasn't enough HP news for you, Bits reports the Palo Alto-based company is also working on an Android tablet roughly twice the size of an iPhone, and seemingly similar to Dell's Mini 5 Tablet. 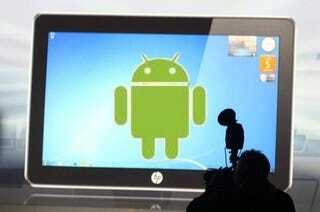 Citing an anonymous source, Bits editor Nick Bilton was told there are multiple tablets HP has in the works, and the Android "half-pint" tablet was one of them. HP is also said to be rounding up magazine content partners for the devices, which include Microsoft, Adobe, BusinessWeek and Wired/Conde Nast.